It’s nearly impossible to talk to Max Holloway without hearing the Hawaiian say the word “blessed.” It’s his nickname, and it pretty much encapsulates the way he goes about living his life. After 12 straight wins and capturing the UFC featherweight title in 2017, it was hard to argue his way of thinking heading into 2018. Holloway opened up about his struggle with depression during his stop-and-start 2018, something he says fighters and athletes as a whole do not talk about enough, and he hopes his transparency allows people have someone to which they can relate their own problems. “I didn’t get it,” Holloway said. “I got a guy on my team, one of my best friends actually, he went through stuff, and I didn’t understand it at the time. I was super hard on him at the time like, ‘Come on. You can shake this.’ Blah, blah, blah. And I had (this) year, and I was like, ‘Damn, this is real.’ I felt bad, and at the end of the day, it’s just crazy. It really is crazy, and everybody (sees) us fighters, us athletes, like we’re superheroes, like we can do no wrong. The 27-year-old said he was inspired by NBA all-star DeMar DeRozan, who has talked about his own battle with depression after posting a tweet in February of this year. DeRozan was a part of the NBA addressing mental wellness issues for its players and has continued to try to help people manage their mental health as well. For Holloway, seeing an athlete of DeRozan’s caliber open up the way he did made him feel like he could and should do the same thing. Heading into a highly-anticipated title fight with undefeated Brian Ortega, which Holloway calls “MMA-insiders fight,” Holloway is still focused on his task at hand on December 8, and in Canada, he feels right at home. “We call Las Vegas ‘The 9th Island’ because a bunch of Hawaiians move there,” Holloway said. “(Toronto) is the 10th island. I’m claiming this as the 10th island. I think Toronto Raptors took it as the 10th island too. They tweeted me last night, so it’s officially the 10th island, so all you Hawaiians, you got to come on over to the cold island. The second island that has snow on it is Toronto, so it’s amazing. I can’t wait. If the Raptors tweeting at him didn’t validate his Canadian ties, a name-check in a song from the city’s most-famous rapper certainly did. “Max said they only bless when they attached to you / The only deadbeats is whatever beats I been rappin’ to,” Drake rapped on “8 Out Of 10” from his latest album, Scorpion. To further cement Holloway’s ties to Drake, the two met at a recent Raptors game. Meeting Drake, getting name-checked in songs, having snowball fights with his friends — Holloway is certainly living his best life heading into UFC 231. In a year that could have broken him, Holloway seems to have broken through, and when “Blessed” makes his way to the Octagon for the first time in a year, he said to expect the same “smiling Hawaiian boy” people have come to love. If he picks up where he left off in 2017, few fighters can put on a show the way the featherweight champion can. UFC: First things first. How are you feeling heading into fight week? Max Holloway: Feeling like a champ. I can’t wait. I can’t wait. It’s been too long. UFC: You have 12 straight wins. How do you keep that momentum after such a long layoff? MH: Every fight, I’m a different fighter. The win streak comes with it. It is what it is. I don’t focus on win streaks. I want to win every fight. People come over to my house and ask me, ‘Where are your belts?’ They’re in the closet. It’s like, ‘What? Why don’t you put them out somewhere?’ I’m like, ‘I’m not done yet. When I’m done, I can hang it up and put it on display for people to look at or whatever, but I ain’t done. I ain’t close to being done.’ Those bad boys are going to be in the closet until I figure out, like, now it’s time to show it off. Right now is not time to show off. Right now is time to work. Keep working and keep doing it, so it’s the same boy. Same Hawaiian. Same guy, same training, same everything. Just got to go out there and remind people because it’s been a year. UFC: Your opponent, Brian Ortega, is obviously very successful as well, and this fight has been coming for a while now. Where are your advantages against T-City? 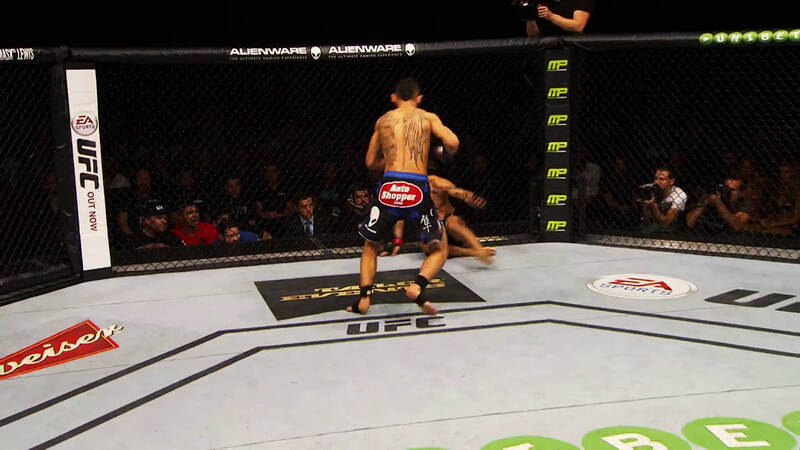 Take a look back at UFC featherweight champ Max Holloway's Top 5 Finishes. MH: We’re about to find out. That’s the beautiful thing about sports. We’re about to find out. Everybody is saying this is the guy. Like I said before, the last 12 guys, everybody said that was the guy that was going to beat me. We’ll see what happens. We’ll go out there, we’ll fight my fight and we’ll go out on top. I respect every single aspect of his game, but at the end of the day, he’s got to face me, so when the Octagon doors close, we’ll find out. MH: I’m here with them. I’m on that same wave. I’m not trying to guide them. I’m not trying to do nothing. I don’t have to. We’re all leaders. Us Hawaiians are warriors, and when you come up, we’re all catching the same wave. It’s the Hawaiian wave. Me and Yancy (Medeiros) are yelling it. The Hawaiian tidal wave, and any Hawaiian that wants to get on and start paddling, start paddling and stand up. Let’s go. UFC: Back to your opponent, I’m trying to think of any other card where the main event fighters were both so well-liked and well-respected. Do you see similarities in how you and Brian approach the game the same way? MH: It’s cool. This fight is an MMA-insiders fight, a fighter’s fight. Actually, the whole card is, and this is one of those matches where people are like, ‘Oh, I wish these two guys could fight each other in their prime.’ Guess what? You got it here, and it’s for the most important fight. It’s for the UFC featherweight championship of the world, so it’s cool to see. And everybody keeps telling me this and that, but Brian is here for a reason. He did his job, and he’s standing across from me in the Octagon on Saturday night, so I’m just excited. I’m stoked, and I like the challenge. These are the fights that excite me. He’s one of the guys where, when everything is said and done, and people look at my record, I want people to be like, ‘Oh, wow. This guy? This guy? This guy?’ So, I’ll just keep adding them to the list. Brian “T-City” Ortega, and his striking coach James Luhrsen call in. With A Victory At UFC 231 Jedrzejczyk Will Become The First Woman In UFC History To Win Titles In Two Weight Classes. "I’ll go in there and work to finish as usual,” he offered.